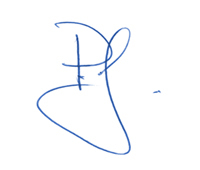 Shifting Share | DiNuzzo Index Advisors, Inc. 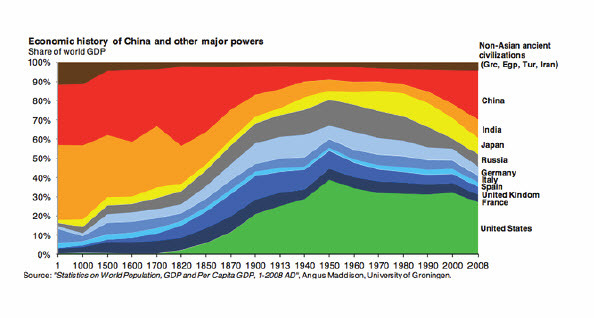 If you want to see global economic history in a single colorful graph, check out this one, produced by The Atlantic magazine. It shows the share of global GDP for various countries since the year 1 AD. What you see in the early years might surprise you. India accounted for almost 40% of global GDP during the height of the Roman Empire, and China accounted for another 30%. Europe and the U.S. didn't make up more than 50% of total world economic activity until the mid-1800s, and the rise of the U.S. economy is-visibly-one of the great economic stories of all time. The shifting economic heft is not hard to explain. Before the Industrial Revolution, the size of a country's economy was measured by the size of its population; there wasn't a lot of leverage due to technology or innovation. When technology began expanding the impact of some nations' citizens but not others, there were significant shifts. Notice that the U.K. was basically invisible on the global economic landscape until the late 1600s, and became significant as the steam engine and manufacturing technology was born in its cities. That leverage continues. Today, the U.S. makes up 5% of global population but generates 21% of its GDP. Japan, Germany, the U.K. and European countries generally are punching above their population weight, although less so than in the middle of the 1900s. Meanwhile, the Asian countries (minus Japan) account for 60% of the world's population and just 30% of its GDP. Will that last? Probably not. You can see the same technological leverage starting to work in favor of China, which is on track to enjoy the world's largest GDP, as it did in the 1700s, while the U.S.'s share of the world's economy is slowly eroding.